Magic DVD Rip Studio Pro backups your favorite DVD to VCD(MPEG1), SVCD(MPEG2), AVI, WMV, 3GP, iPod, PSP, MP4 format with ease! Download Magic DVD Rip Studio Pro by Magic Video Software Inc.
PCWin Note: Magic DVD Rip Studio Pro 7.2.7.16 download version indexed from servers all over the world. There are inherent dangers in the use of any software available for download on the Internet. PCWin free download center makes no representations as to the content of Magic DVD Rip Studio Pro version/build 7.2.7.16 is accurate, complete, virus free or do not infringe the rights of any third party. 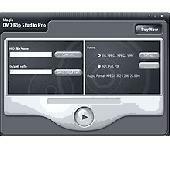 PCWin has not developed this software Magic DVD Rip Studio Pro and in no way responsible for the use of the software and any damage done to your systems. You are solely responsible for adequate protection and backup of the data and equipment used in connection with using software Magic DVD Rip Studio Pro. Fox DVD Ripper Pro - Fox DVD Ripper Pro is designed for backup your favorite DVD movie to your computer by converting DVD to AVI, MPEG1, MEEG2, WAV, 3GP, iPod, PSP format video files, with almost same quality, but just only 10% size. DVD Rip Master Pro - DVD Rip Master Pro is an ideal method to dup DVD or rip DVD or make backup DVD copy. You can rip entire DVD or just part of it by chapter. Fox DVD to iPod/MP4 Video Rip/Convert Solution - Fox DVD to iPod/MP4 Video Rip/Convert Solution features a powerful DVD ripper that can rip DVD movies to VCD, SVCD, AVI or iPod with no quality loss, remains the original picture perfect. Magic DVD to PSP/MP4 Video Rip/Convert Studio - Magic DVD to PSP/MP4 Video Rip/Convert Studio is powerful and easy-to-use DVD Ripping software. The DVD Ripper helps you rip DVDs to AVI, SVCD, VCD, PSP, MP4 format within a few clicks. McFunSoft DVD to PSP Video Rip/Convert Workshop - McFunSoft DVD to PSP Video Rip/Convert Workshop provides you a fast and easy way to back up your favorite DVD movies and not worry about scratch the copies during day-to-day use. With it, you can easily rip DVDs to VCD, SVCD, AVI, PSP and MP4 format. Fox DVD to PSP/MP4 Video Rip/Convert Solution - Fox DVD to PSP/MP4 Video Rip/Convert Solution is an professional dvd software to convert your favorite DVD movies to popular video formats, which include high quality AVI (DivX, XviD...), MPEG (MPEG-1, MPEG-2), WMV, PSP, MP4, VCD and SVCD formats. Magic DVD to 3GP Video Rip/Convert Studio - Magic DVD to 3GP Video Rip/Convert Studio backups your favorite DVD to VCD(MPEG1), SVCD(MPEG2), AVI, WMV, 3GP, MP4 format with ease! AVI WMV 2 PSP CONVERTER - Ace/WinXMedia AVI/WMV PSP Converter is a powerful and easy-to-use PSP MP4 video converter. With it, you can convert AVI(DivX, XviD, MPEG-4, YUV...), MPEG1 MPEG2 WMV ASF video to PSP MP4 video files and play them in your Sony PSP. M4A to MP3 Converter - M4A to MP3 Converter is an easy, efficient, fast yet free M4A to MP3 converter. It is capable of converting M4A to MP3 easily and quickly. Magic MP3 Tagger - Magic MP3 Tagger is more than a normal ID3 tag editor. This program can fix and organize your music collection automatically. It uses a high sophisticated music identification algorithm to repair, edit, tag and rename MP3 files. More Software of "Magic Video Software Inc."
Magic DVD Rip Studio - Magic DVD Rip Studio is a professional DVD ripping software to convert your favorite DVD movies into popular video formats. With a very easy to use interface you also can convert VOB, IFO files into above formats. Magic DVD to iPod/MP4 Video Rip/Convert Studio - Magic DVD to iPod/MP4 Video Rip/Convert Studio is an easy-to-use and powerful DVD rip software for Apple iPod. It can convert almost all DVDs to VCD(MPEG1), SVCD(MPEG2), AVI, WMV, iPod, MP4 format with ease! Magic Flash Decompiler - Magic Flash Decompiler is professional SWF decompiling software which offers a treasure trove of tools for those who want to extract elements from flash movies, edit dynamic texts and images of flash movies. Magic Video Converter - Faster, better, more; that's what Magic Video Converter is all about. It can burn and convert: AVI, MPEG, MPEG 1, MPEG 2, MPEG 4, VCD, DVD, SVCD, RMVB, RM, WMV and any most used video formats. Besides, it is compatible with DVD burning. Magic Music Workshop - Not only can you use Magic Music Workshop to grab music from a CD, but also record audios. Stop there, and burn your improved, converted audio files to disc. Or use the advanced audio editor to create your own music that you can transfer to CDs. Magic 3GP Video Converter - Magic 3GP Video Converter is a professional 3GP converter to convert popular video to 3GP, 3G2, or MPEG-4. It supports converting all most used video format for computer and other device. Magic Mp3 CD Burner - Magic Mp3 CD Burner is intuitive music burning software! You can use it to burn more then 200 songs on one CD. Magic Music Editor - Magic Music Editor can record your own music, voice or other audio, edit it, mix it with other musical parts, add effects like reverb, chorus, and echo, and master it so that you can burn it to a CD, post it on the World Wide Web, or e-mail it.